30 Rock season 6 continues rolling with its second episode “Idiots Are People Two!,” introducing a new love interest for Liz Lemon with James Marsden, and putting Tracy in a difficult spot after an offensive rant of his goes public. “Idiots Are People Two” consistently keeps the laughs rolling, even as part one of a two-part installment, but might unnerve viewers reading into its meta-references. After last week’s “Dance Like Nobody’s Watching,” I started thinking about the way 30 Rock tends to approach Liz’s ever-changing relationships with men, namely the cycle they typically follow. Many of Liz’s love interests come from celebrity guest stars, who naturally can’t commit to appearing for more than a few episode. The same rings true of all TV series with perpetually single leads, but it’s of interest to note the work-arounds TV employs to keep relationships going, like how even after Elizabeth Banks’extended guest presence Avery remains a regular point of discussion, despite her captivity in North Korea. After a long cycle of stop-starts to Liz Lemon’s relationships, I assumed Matt Damon’s Carol would follow a similar path in that contextual reasons like his piloting career could keep the character in play without NBC necessarily plunking down on an A-list celebrity week after week. Carol offed a nice change of pace to Liz’s usual relationship flame-outs, though predictably had to fall by the wayside as well. Like most shows might ask of themselves after five seasons, we have to wonder just how much more we can invest in the lead character’s search for true love. Of course, the natural solution from any higher-up’s perspective would be to fold things in on themselves and push Jack together with Liz, gross as it may seem. Long has 30 Rock revolved around the friendship between the pair, and even joked about the idea of putting them together, usually remaining firm in their platonic nature. 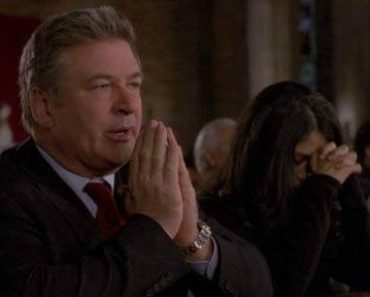 Were 30 Rock to last only one more season, I wouldn’t be terribly surprised or even outraged if the writing began to insinuate an extraordinarily awkward, but honest love connection between the two; provided we didn’t have to actually watch said squick. Yet, ‘Idiots are People Two!’still pushes a great deal toward the idea that Liz’s relationship with Jack tends to overshadow her more romantic connections, quite literally in this case, as we see that Liz can’t get Jack’s voice out of her head when it comes to evaluating her new man Criss (James Marsden)’s lesser qualities. 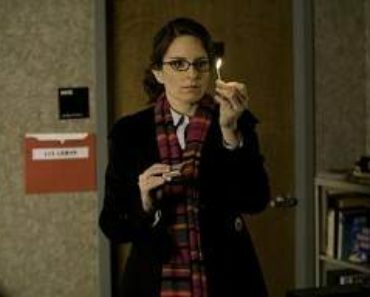 Early promos for 30 Rock‘s new season suggested that Liz might have found something genuine with her new romantic interest (and recognizable though he may be, I wouldn’t think James Marsden to be too busy to stay on in a semi-regular capacity), but now within one episode Liz Lemon’s latest clearly won’t stick. In a way, it’s telling of 30 Rock that we’re not even privy to the beginning of their courtship, as if after 6 seasons Liz’s relationships eschew significance so often we don’t even need the build-up anymore. I liked ‘Idiots are People Two!’, even though I’m not fond of episodes that arbitrarily open on a shocking sequence of events for the purpose jumping back in time to explain them. Lord knows we’ve all had our fair share of Kelsey Grammer unexpectedly bursting through our doors in a tuxedo, but I believe that playing with time perspectives in screenwriting should serve a concretely justified purpose beyond shock value. Granted ‘Idiots are People Two!’acts as the first in a two-parter, something I probably should have known beforehand, so there may yet be more story explaining why we needed to know about Pete’s predicament before anything else. As I said, I liked tonight’s offering, which had me consistently giggling throughout. Sometimes I feel like even the thinnest of 30 Rock plots could squeak by on charisma and non-sequiturs, but ‘Idiots are People Two!’kept a strong balance of Liz, Tracy and Jenna plots even without its second half next week. And while I’m not always keen to invest in Jenna plots given the character’s proclivity for malice, Kenneth’s role in the antics helped make up for his rapture story getting shortchanged last week. There’s always been an odd sort of bond between the two, and I’m interested to see how their selfish pilfering of fluorescent lights plays out next week particularly with Kelsey Grammer now on board. Now, the other component to ‘Idiots are People Two’strikes something of an unusual note with 30 Rock‘s meta-addressing of Tracy Morgan’s homophobic rant last summer. To be honest, I hadn’t remembered much of the real-life incident until it came up in the episode, and that absent-mindedness likely proved one of the only ways to enjoy the storyline. Tracy once being again brought down for his outrageousness, to the point where he’d organize a counter-protest for Liz’s defamation of idiots spearheaded by Denise Richards make for good fun, and I imagine the writers had a great deal of fun in coming up with all the sub-sections of the idiot group to portray. 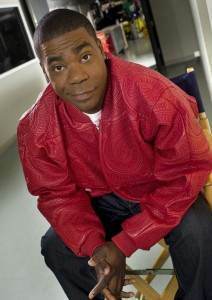 Then, I refreshed myself on the real Tracy Morgan’s rant. Yeesh. Time, public apologies and 30 Rock‘s good humor not withstanding, they probably should have left this one alone. I don’t believe the real Tracy Morgan to be a truly bigoted person by any means, but I also don’t believe that kind of ugliness deserves to be spun into light-hearted sitcom fodder, particularly when the 30 Rock version so sheepishly tones down the real offensiveness of Tracy’s words. But…hey. We’re all here to have fun, and for all we know, next week’s continuation might leave us with a more intelligent resolution to the story. Or at the very least, more reasons to laugh at Denise Richards. Like the already-parodied ‘celebrities die in threes’rule, it would seem 30 Rock has its own pattern of celebrity guest stars in threes, here with James Marsden, Denise Richards and Kelsey Grammer. I especially enjoyed Jenna’s B-list name-dropping of Teri Polo and Ving Rhames. Mean, but fair. As much as I like putting Kenneth in the spotlight after last week, it is a little jarring that there wouldn’t be any further fallout from Kenneth’s religious episode. I know that Maulik Pancholy has a commitment to Whitney now, but it seemed jarring to see another receptionist outside of Jack’s office. I forget, has Jonathan’s absence been addressed yet? Considering how popular Frasier was during my youth, I find it odd that the public opinion of Kelsey Grammer following his various scandals and his role in Boss has shifted toward masculinity rather than refinement, well exemplified by his James Bond-style closer.